It occurred to me that I have not published my editorial calendar for 2007; i.e., the list of content subjects for SSPA Research this year. As you SSPA members know, there is a different topic each month, and I publish 2-3 reports a month on that topic. There is input from members on the reports; community members vote each month for a report title they want to see the following month. If you’d like to be a member of the SSPA community, and receive the monthly newsletter (SSPA News) that includes the ballot, please join! Community membership is free. How did I pick the monthly topics? A lot was based on the findings of the SSPA 2006 Support Technology Survey, which identified the adoption rate of various service and support technologies by our members, as well as what technologies members have budget allocated for additional purchases in 2007. The monthly topic list reflects areas with the highest adoption, for which members are hungry for best practices, as well as areas with a high percentage of members shopping for solutions, for which members are interested in which solutions best fit their needs. Quality Monitoring Best Practices: How often should agents be monitored? As those of you who know me can attest, I have an opinion on just about anything. And after spending 5.5 years as an analyst for Giga and Forrester, where I was encouraged to have strong opinions on everything, I’m usually happy to add my 2 cents on any topic or question. But a man has to know his limits, and when pressed for information in an area where I happen to know an expert, I’m quick to reach out for help. Having been around for the birth pangs of CRM, I’ve amassed a pretty good network of experts over the years. So, when I was asked last week for some ‘best practice’ advice on quality monitoring (QM), I turned to the man I see as the ‘best practice’ guru for all things QM, Oscar Alban. Oscar is Principal Global Market Consultant for Witness Systems (recently acquired by Verint), which means he provides best practice advice to Witness customers, including ongoing ‘tuneup’ calls to be sure customers are maximizing the software to achieve their quality goals. Like myself, Oscar had a long career managing call center operations before stepping over to the vendor side of the house. Will In-Home Services Ease Home Theatre Complexity Curve? Like many Americans, I spent President’s Day wandering around my local electronics store, dreaming of owning an HDTV larger than my car. The Consumer Electronics Association estimates that digital television sales for 2006 were over $20.5 billion, up more than 30 percent from 2005. With prices continuing to fall (including many decent size HDTVs now under the $1000 mark) I think the increase in 2007 sales will be even higher than 30%. I know SSPA members are already familiar with remote support tools for remote control and remote diagnostics. 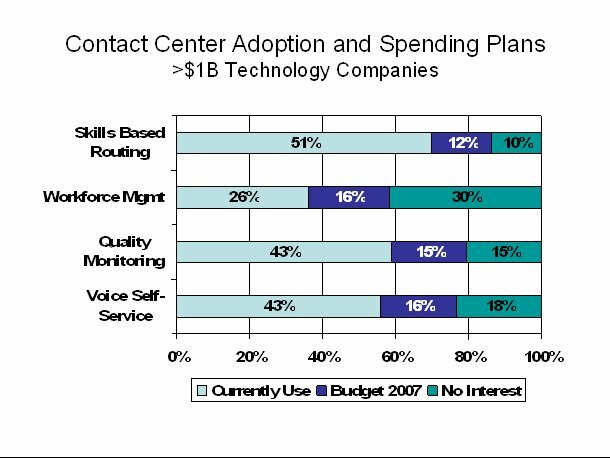 According to my 2006 SSPA Support Technology Survey, 46% of our >$1B members have remote support technology in place. The ROI of these tools is obvious: instead of walking customers through complex procedures to check or adjust settings, the agent can take control of the computer remotely and just drive. Average talk time goes down, first call resolution rate goes up. Even companies with great training programs and strong knowledgebase tools should find ROI for a remote support purchase within 12-18 months (though many case studies show ROI in 6 months or even less). As a technology analyst, I spend several hours a week attending briefings with technology vendors, understanding products and functionality, new releases, product roadmaps, new customer wins, etc. Some of this information is exposed in published research, but most is not. I will be using this blog as a way to pass along some of the learnings I’m taking away from these briefings. Those of you who have been reading my research know that I have been critical of both SAP and Oracle for spending the last 2 years focusing solely on differentiating their enterprise applications with infrastructure. Now, don’t get me wrong, I totally support moving toward componentized, standards-based architecture, but when business users are trying to determine which vendor will give them the best business value via processes and functionality, hours of PowerPoint slides on SAP’s NetWeaver vs. Oracle’s Fusion doesn’t help. I was surprised to read the press release yesterday that Witness Systems is being acquired by Verint. I was totally out of the loop on that one! I count a few folks at Witness as friends, having worked with them since they were a strategic partner of mine during my Clarify CRM days. But I guess I am off the ‘advance notice’ list these days. If you don’t know these companies, I suspect you will. 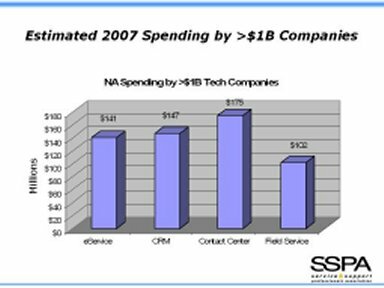 According to the SSPA 2006 Support Technology Survey, our >$1B technology company members have $175M earmarked for contact center technology in 2007, and that includes the product areas in which Verint/Witness have a best of breed product offering. As you can see in this slide, 16% of our larger members have 2007 budget for workforce management (WFM); 15% have budget for quality monitoring (QM)–areas in which Witness/Verint (as well as Nice, Genesys and others) play. Check out our new SSPA Online Buyer’s Guide! I’m pleased to announce that our long-in-the-works SSPA Online Buyers Guide launched this week. With estimated spending by our >$1B members in 2007 on new service and support technology around $500M, clearly we need to help members identify “good fit” technology for their projects. You are currently browsing the Ragsdale’s Eye on Service weblog archives for February 2007.